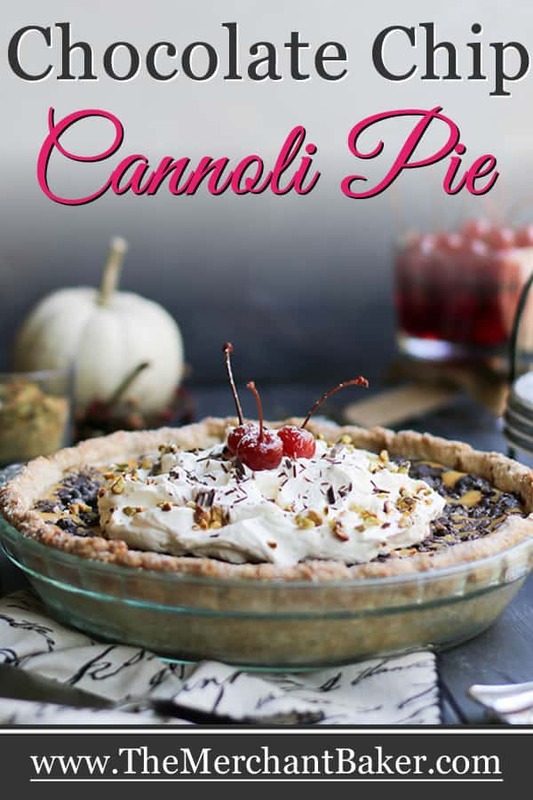 I’ve created a new favorite pie for you! 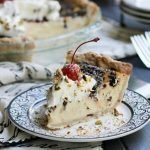 Chocolate Chip Cannoli Pie! 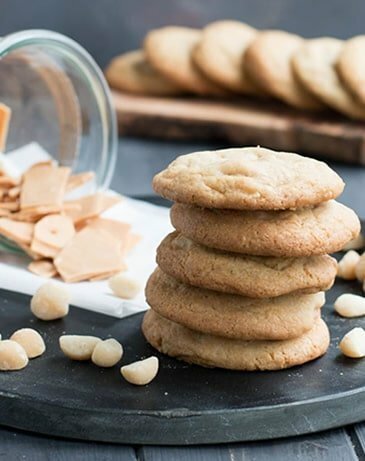 The filling is rich and creamy with plenty of mini chocolate chips to please. The crust has just a hint of cinnamon. 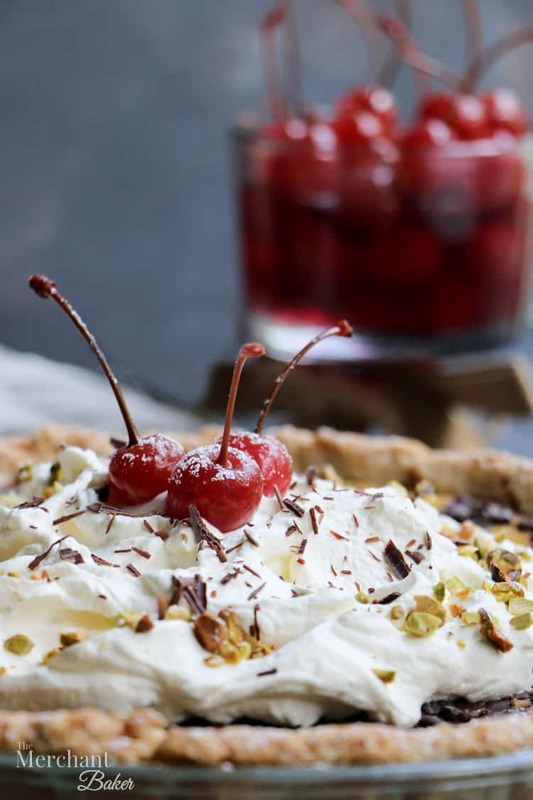 Pile on fresh whipped cream, chopped pistachios, some chocolate shavings, and don’t forget the cherry! 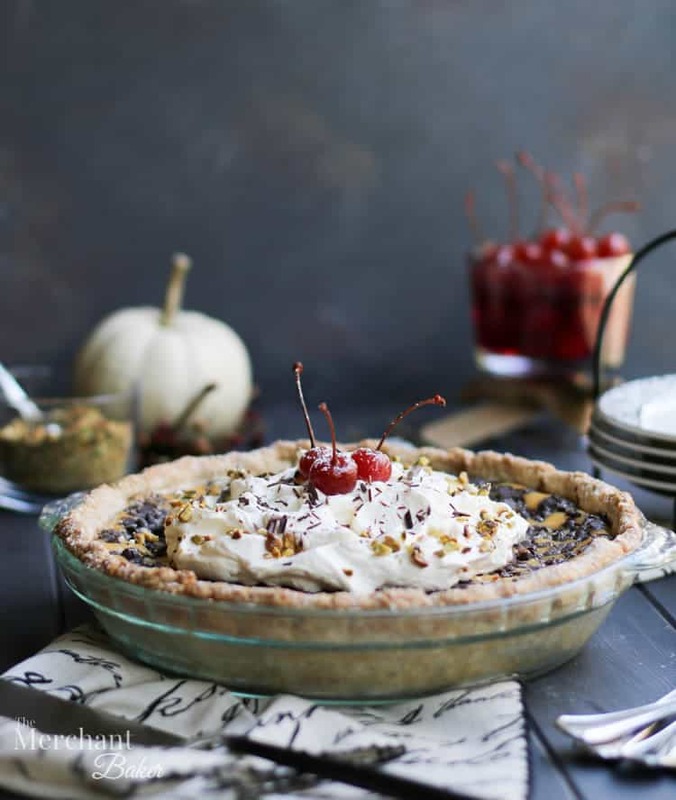 My plan was to get you this recipe before Thanksgiving, you know… so you could add it to your winning pie repertoire :) But, alas, it was near impossible to do so. Yep, it’s been a minute or two since my last post and trust me, it’s been weighing heavy on my mind. For my regular readers, you may have noticed some post irregularity over the past few months and a downright absence of late. It hasn’t been for a lack of will nor ideas to post. Lord knows I have at least 20 or 30 extra ideas of recipes I’d like to create for every one I actually post. It’s insane. In fact, my general schedule has been to post once a week. In the early days of the blog, I posted three times a week. Those three posts, in the early days, had me working a good 60-70 hours a week. I know. It doesn’t look like it could take that long; there’s a lot more to food blogging than meets the eye. 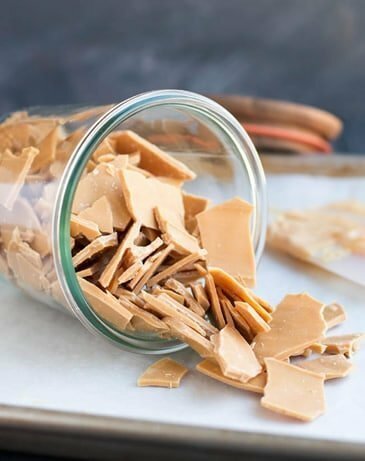 If you take all the trial and error of recipe development and shopping for ingredients… and looking for photo props… and shooting the process, then editing the photos…Then there’s the writing and the social media sharing etc. etc…Well, it simply takes a lot of time. I’m not complaining. I love it. It’s been a fun filled, creative ride. I’m going through a transition though… I am, “The Merchant Baker,” after all, and I have to admit that I’ve missed the “merchant” side of things. So, I took an opportunity to be a merchant again and I am really excited about it. I’m back to working on developing product and identifying trends in fabric and color…learning about my customer and what she wants, analyzing the business and making plans, setting up calendars and process. Now my days are filled with reviewing photo shoots with models in pretty clothes instead of shooting delicious food on pretty plates. Needless to say, my life has completely changed… and my family? Well, we’re all getting used to a dramatic change in schedule. I will say though, that this merchant opportunity was unexpected, so I didn’t exactly have a plan in place for the blog. So here’s what I’m going to tell you for now…the blog isn’t going anywhere. It’s simply going to have to transition right along with the rest of us. 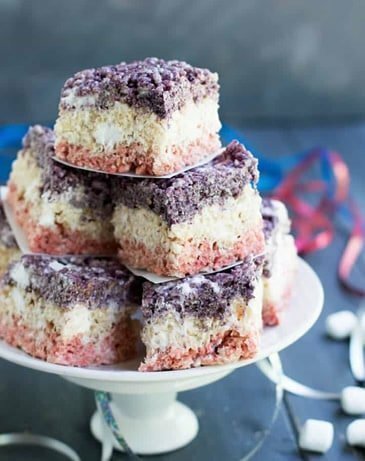 I’ll still be here for any questions you may have about the recipes that are already posted and to answer any emails you send. 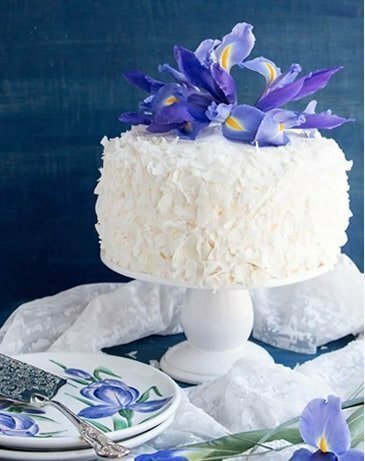 Behind the scenes, I’m still going to be creating new recipes and baking and cooking up a storm because that’s what I’ve always done…before the blog, during the blog, after the blog. 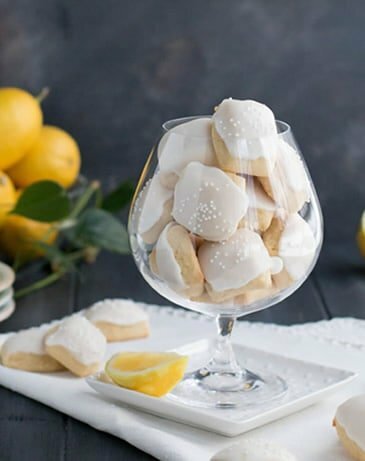 I have 1000 more ideas for recipes than I could ever post. As we speak, I’m baking Christmas cookies and experimenting with some new ideas. Fingers crossed that some of them will turn out to be new favorites. At some point, I will try to find time to document and share them with you. 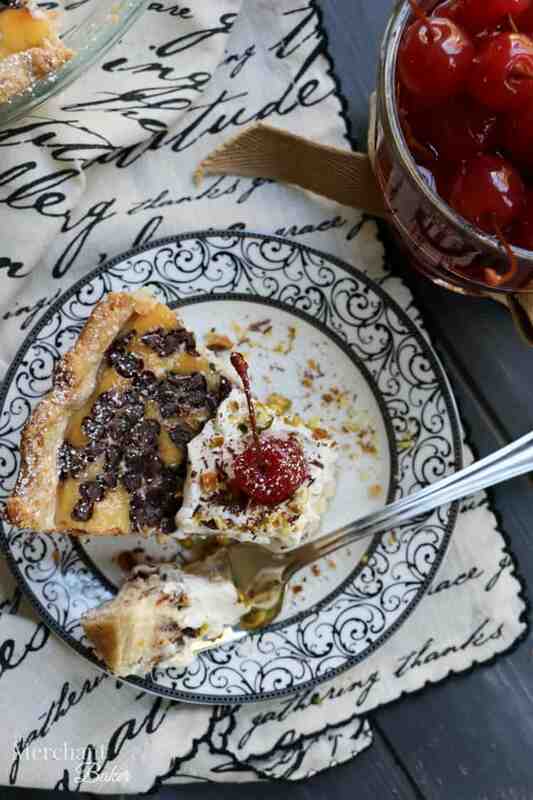 Okay…enough about life changes and blog futures…let’s talk about this pie. If you ask me if I like cannoli, I’ll probably tell you that I LOVE cannoli. But, when I actually eat cannoli, I always kind of feel like I just like it, not love it. I don’t know. I do really like cannoli, but what I really, really love is sweetened ricotta and chocolate chips. That’s why I layered it up with some vanilla wafers for these No Bake Ice Box Cannoli Cupcakes. Ummm, and I really, really, really love “cannoli” in these Chocolate Chip Ricotta Cannoli Scones. 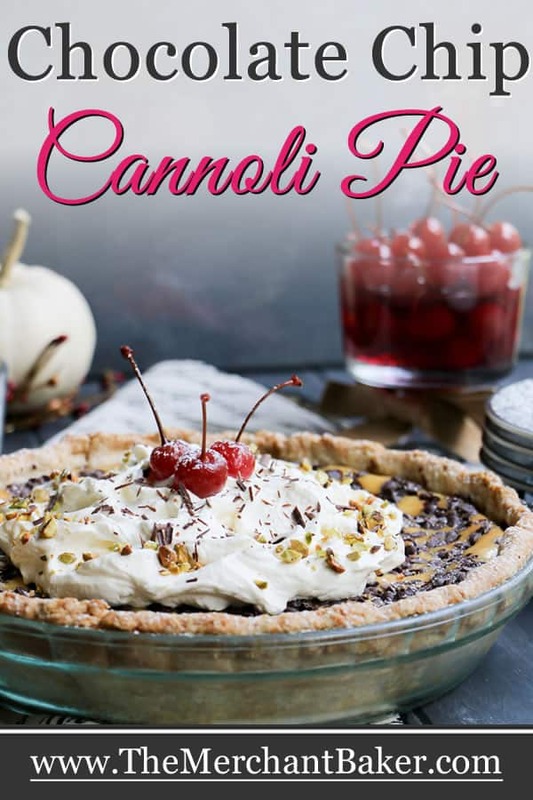 I was feeling the cannoli vibe again recently, but I wanted to make it in pie form. And, OMG, I’m so glad I did! Chocolate Chip Cannoli Pie turned out to be a cannoli revelation! While this post has taken an eternity to get to you, trust me when I tell you that I’ve been talking about this pie to everyone who will listen for the past couple of months. Easy All Butter Pie Crust with Cinnamon! This is where all good pies begin…with the crust. For long time readers, you know this is my go to crust. It’s all butter and it’s delicious. With all the tips and tricks I share in that post and accompanying video, I truly believe making pie crust is not a difficult thing. Really. I’m serious. If you’ve never made pie crust, it might take a few tries to get comfortable, but it is totally doable. The only change I make to the original recipe is to add a hint of cinnamon. It makes a difference. I only added a 1/4 teaspoon, so it sits in the background and doesn’t overpower the crust or the pie. I won’t go into all the details on the pie crust here. There’s plenty of info in the post to support your success. Oh, and if you are absolutely adamant on not making the pie crust from scratch, feel free to buy one pre-made. I would sprinkle a little cinnamon over the crust before you fill it. Five ingredients is all it takes. Get out a bowl and whisk 3 eggs with ricotta and vanilla. Whisk in the sweetened condensed milk. That’s it. That’s the base. Four simple ingredients. The fifth is the chocolate chips. While I was developing this recipe, I checked out all the custard type pies with chips in them. So many of them had the chips sinking to the bottom of the pie. First, I used mini chips. Mini chips are lighter than regular chips and less likely to sink. Second? I tossed them in a spoonful of flour. The flour is supposed to give the filling something to grab on to while the pie bakes. Third? At the last minute, I decided not to mix them into the batter. 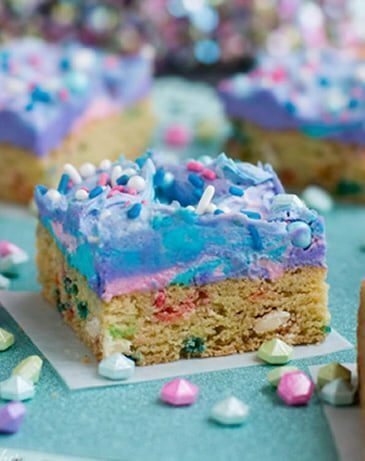 I sprinkled them right on top of the filling. I figured, if they’re going to sink, let them try to sink all the way from the top. Maybe they’d end up in the middle instead of at the bottom. I thought, hmmmm, maybe next time I’ll mix in half of the chips and sprinkle the other half on top. Maybe they’d all stay right where they were supposed to. Or, maybe I’d skip the tossing them in flour step. I have to tell you that after we polished off the last piece of the pie, we unanimously agreed that we liked them on the top! Second, having the chips in one layer concentrated the chocolate and gave texture to the top. So, while I didn’t want them to melt into a layer on the bottom, I was completely fine with having them on the top. Third, they didn’t interfere with the rich and creamy cannoli layer. We actually liked that part of the pie not having any added texture. And fourth, I liked the depth of color the layer of chips added. It worked in perfect contrast to my other toppings. 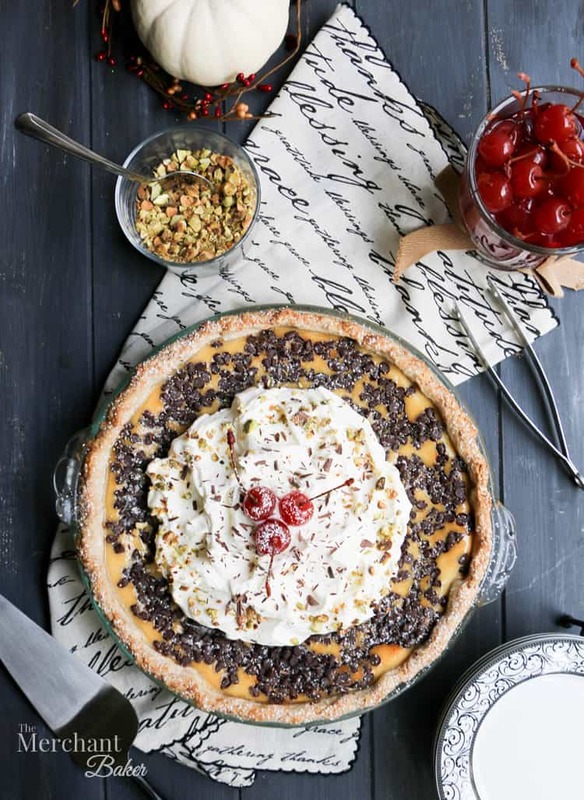 Once the pie is baked and cooled and you’re ready to serve it, it’s time to pile on all of your favorite toppings. I went with a billowy pile of fresh whipped cream, chopped pistachios, cherries and shaved chocolate. In other words, I had a field day with it. And then, because too much is not enough, I gave the whole pie a sprinkling of confectioner’s sugar. 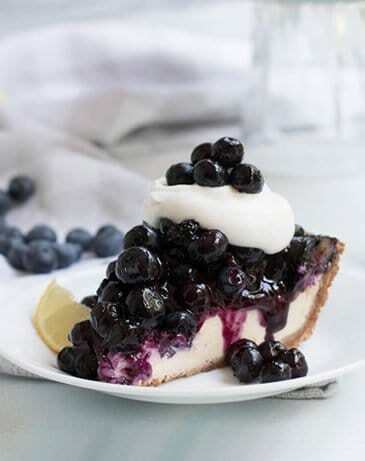 Seriously, now…how pretty is this pie? I mean, it’s got festive celebration written all over it. And taste? For me, every bite was swoon worthy. It was like a cannoli cheesecake but with a more custardy texture. I swear it’s the only way I want to eat cannoli forever and ever. 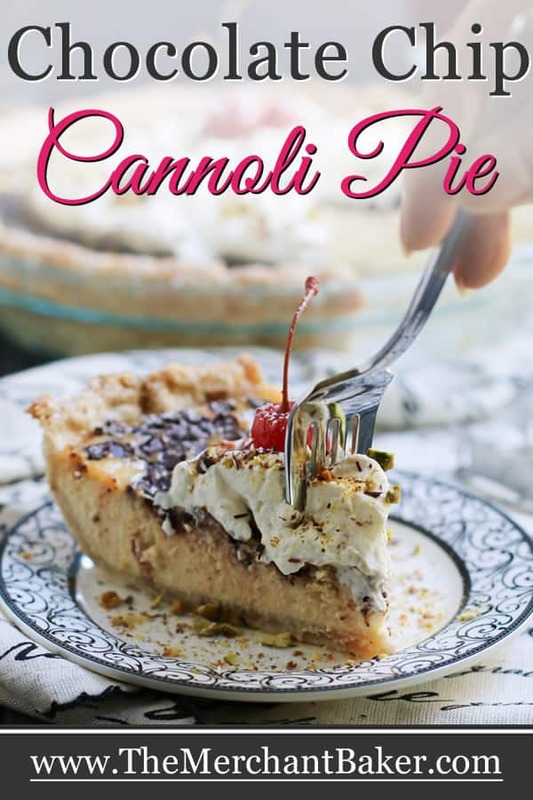 It has all of the flavor of cannoli but with texture and flavor in all of the right places. 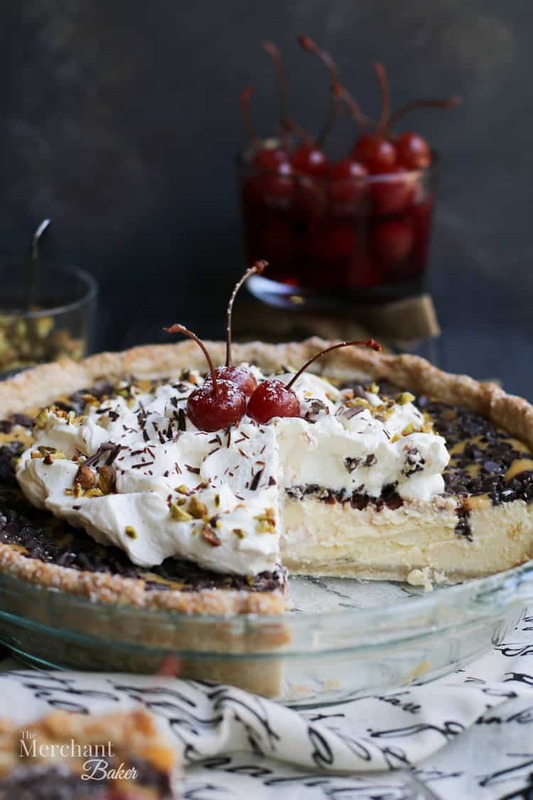 You can also customize this pie with additional flavors. Do you love a hint of orange with your cannoli? Add a bit of zest and a little fresh juice to the filling. Do you want to pump up the cinnamon in the crust? Add more to taste. And the filling? Really, the filling is so simple you could use it as a base for other non-cannoli type ideas. My brain is swirling with all kinds of variations! So, I didn’t get you this post in time for Thanksgiving, but darn it, I was going to get it to you before all of the holidays were over or die trying. 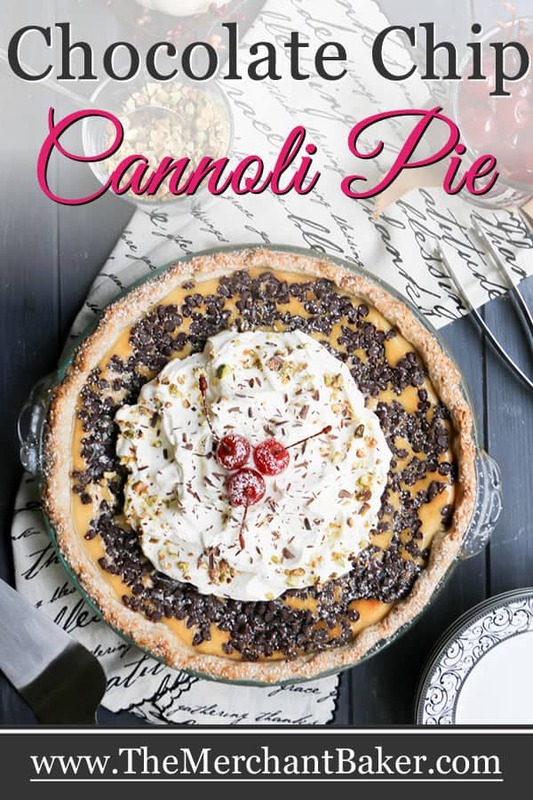 And here it is in all it’s glory…Chocolate Chip Cannoli Pie! It’s a great pie. 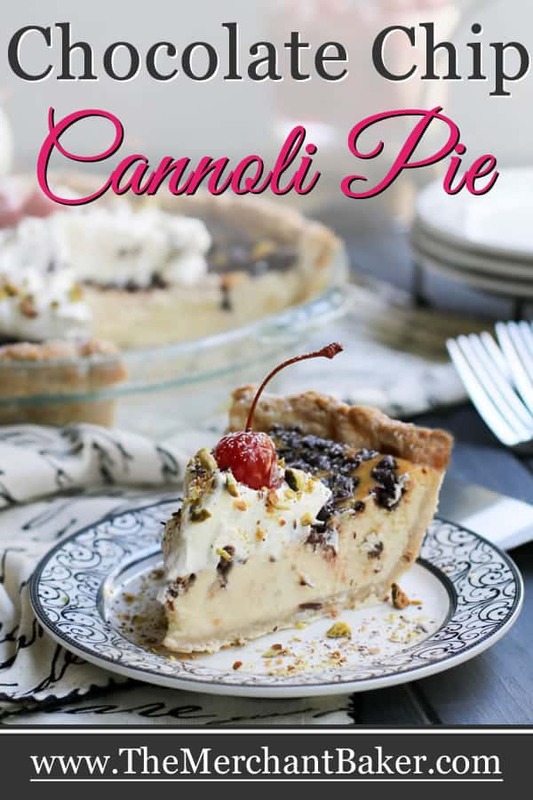 If you love cannoli or even just like cannoli, I think you’re going to love this pie. As for me? In a large bowl, whisk eggs, ricotta and vanilla until thoroughly combined. Add sweetened condensed milk and continue whisking until fully combined. Carefully pour filling into prepared crust. 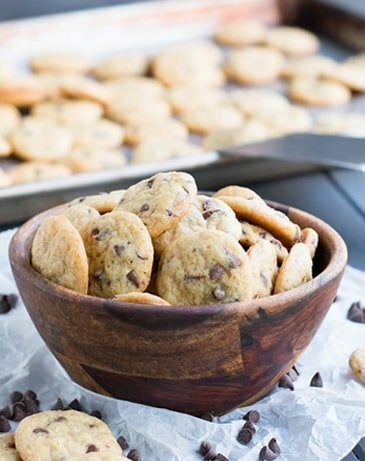 In a small bowl, toss mini chips with a couple of teaspoons of flour. Sprinkle evenly over top of pie. Bake pie for 40-50 minutes or until center is set and crust is golden brown. Check color of crust at 25 minutes. If you feel like it's gotten to your perfect golden brown, see notes below for using a pie crust shield to prevent further browning. 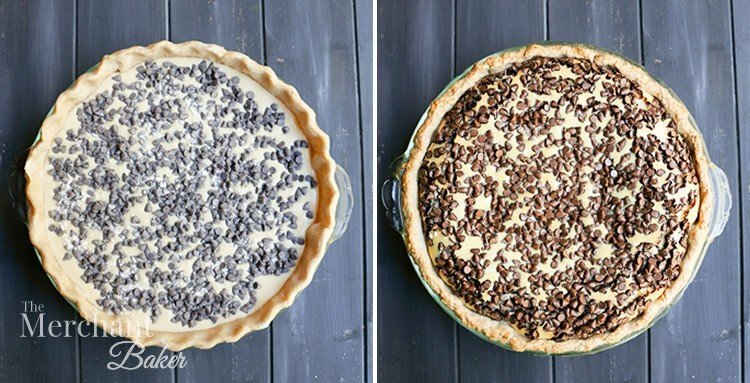 Allow pie to completely cool, then chill in refrigerator until ready to serve. In a medium bowl with an electric mixer, beat cream until it starts to thicken. 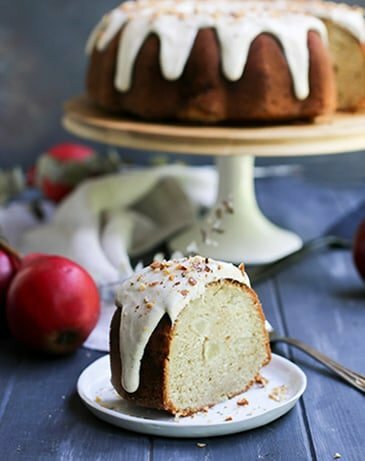 Sprinkle the Tablespoon of confectioner's sugar over the mixture and continue beating until you have soft peaks. Add additional sugar to taste, as desired. Pile whipped cream on top of chilled pie. 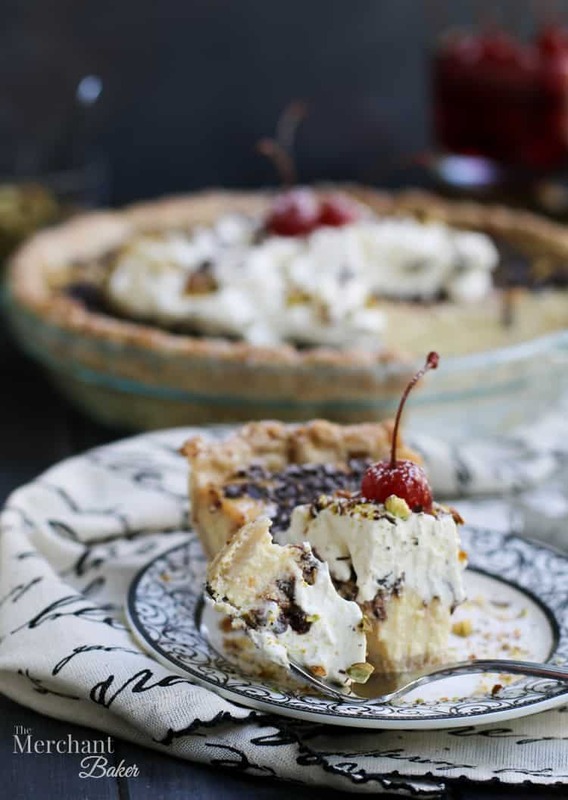 Sprinkle with chopped pistachios, shaved chocolate and maraschino cherries. 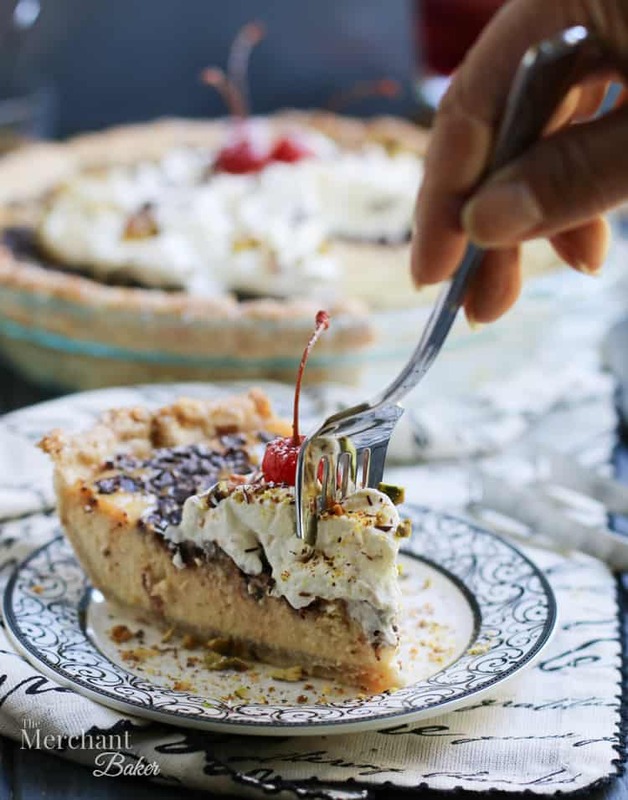 Dust the whole pie with confectioner's sugar and serve. *Here is the link for my Easy All Butter Pie Crust. The only change you'll make is to whisk in 1/4 teaspoon of ground cinnamon in with the flour mixture before you cut the butter into it. I made my crust the day before and left it wrapped in the refrigerator until I was ready to make the pie. *If you decide that you want to take a short cut and use a prepared crust, just sprinkle it with cinnamon before filling. Press the cinnamon gently with your hand (if it's already molded in a pie tin) or rolling pin (if your crust is not already in a pie tin) so that it sticks to the crust. That way, it won't float to the top with your filling. * Check the pie after about 20-25 minutes to see how your crust is browning. I hate an overcooked crust, so at about halfway through cooking time, or whatever point I feel like I need to protect the crust from further browning, I'll cover the crust with a foil shield. *If you don't have a pie crust shield, make one out of foil before you fill the pie. Cut a 12" square of foil. Fold it into quarters and cut out the center and round the edges so that you have a 2" ring. 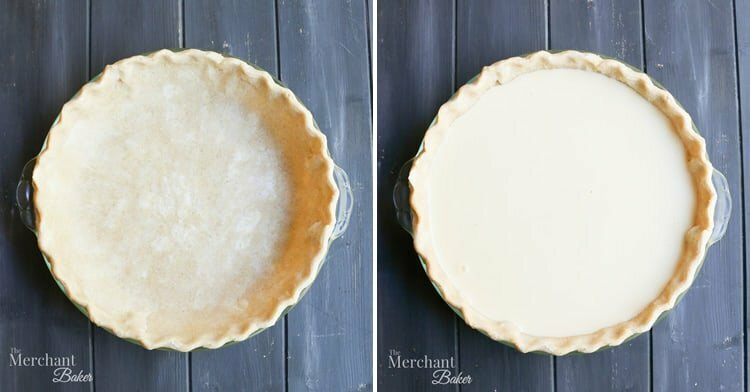 Place it over your unfilled pie crust to easily check size without disturbing any filling. I like to fold the edges over the pie crust and then remove it and set it aside until I need it. You want to do this in advance so when the time comes, you can just quickly open the oven door and place the shield on the pie. *I like a lightly sweetened whipped cream. 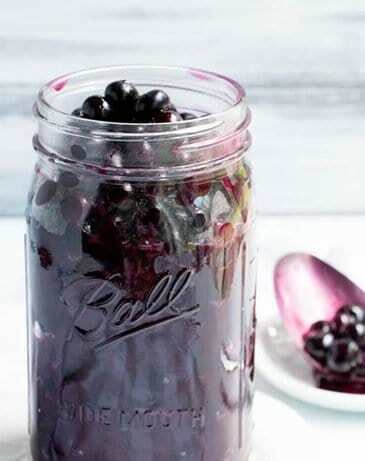 Add more sugar to taste if you like yours sweeter. 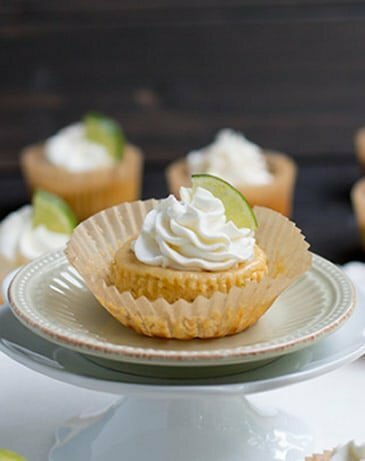 Cinnamon or orange zest would also be fun additions to the whipped cream if you'd like to add some additional flavors. 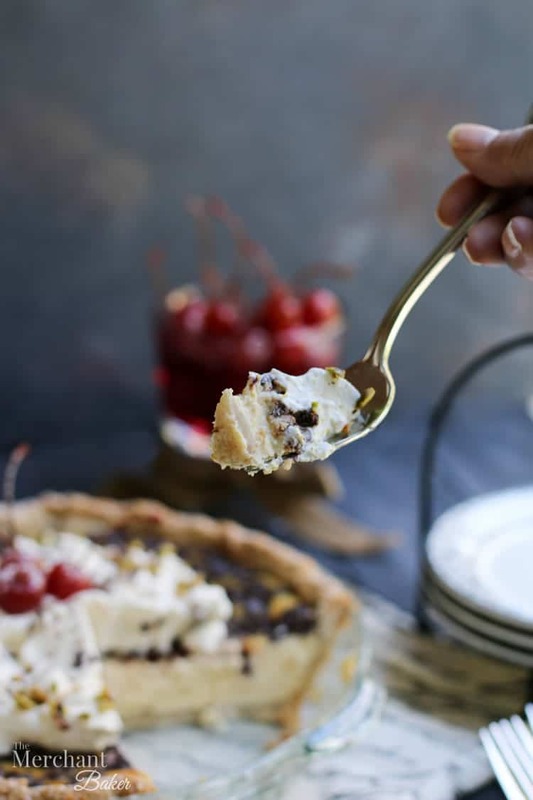 *If you're topping the pie with cherries before serving (because it's so pretty) make sure to blot the cherries dry with paper towels so they don't bleed liquid all over the whipped cream topping. 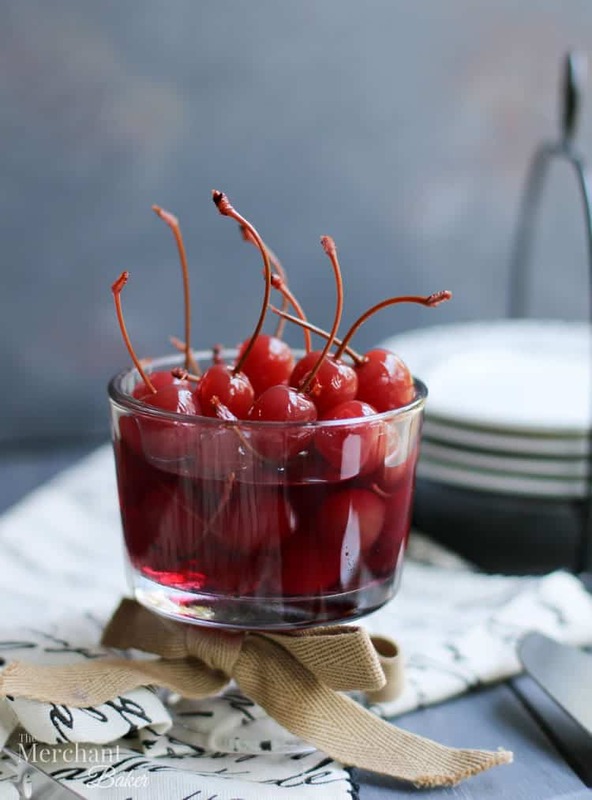 I did that and then served additional cherries in a bowl on the side so that each slice could be topped with an individual cherry. 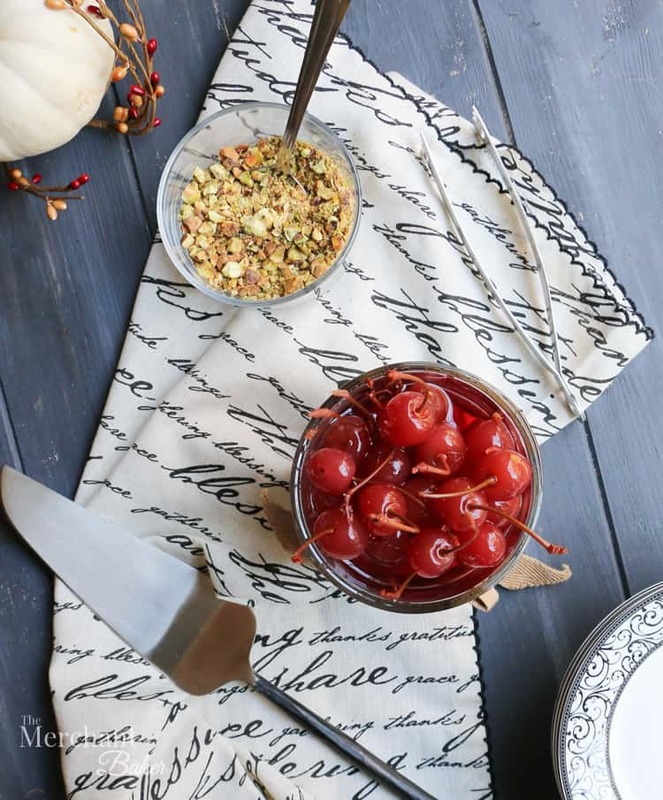 *I use Tillen Farms maraschino cherries. I usually find them at Whole Foods. I prefer them because they have no artificial colors, dyes or flavors. *To shave chocolate, I just use a vegetable peeler and scrape along the long side of a chocolate bar. If you're looking for curls, microwave the bar for a few seconds to soften it a little. This will help you get longer curls. I’ve missed your posts. So happy to find out that you are OK. Good luck with your merchant endeavors. Your recipe looks delicious. 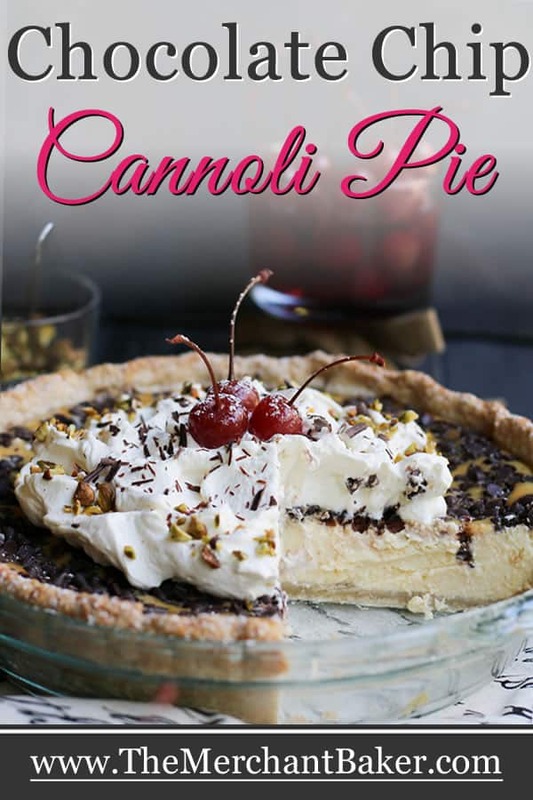 Gonna make it for my cannoli obsessed hubby! I’m definitely OK, but barely had time to communicate that. Hopefully, there’ll be time for a post here and there in the future. I hope you enjoy the pie. I loved it! I made this yesterday. 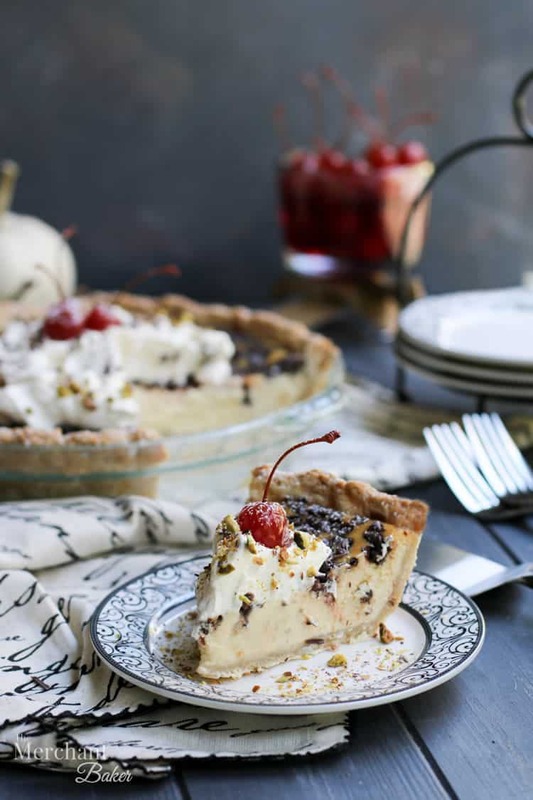 We had some–still a wee bit warm–last night, and it was quite good, but today, thoroughly chilled–oh my, I have a new favorite pie! It is every bit as good as you say, maybe even better! 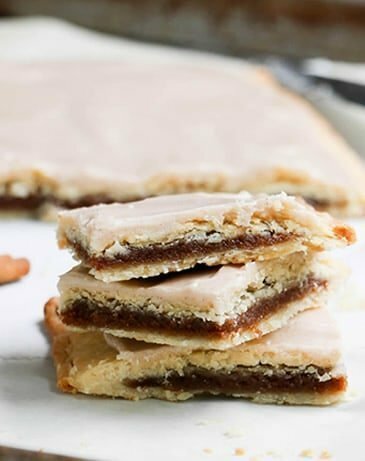 Move over cinnamon scones, I think I have a new favorite Merchant Baker recipe. THANK YOU!! You’re welcome, Nicole! We really loved the pie and I’ve made it twice since the post!